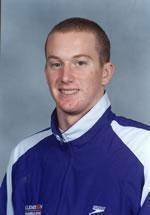 Clemson Swimmer Tommy Rappold was named to the 2005 ESPN The Magazine Academic All-America University Division Men’s At-Large Team announced by the College Sports Information Directors of America on Tuesday. Rappold finished his Clemson academic career with a 3.96 GPA, in Computer Information Systems. He is just the second male swimmer in Clemson history to be named first-team Academic All-American, as he joins Will York (1999) with that distinction. This is the second consecutive year Rappold has been honored for his academic achievement, as he was a second-team CoSIDA Academic All-American last year. The native of Roanoke, VA is the seventh student-athlete in Clemson history to be named an academic All-American by CoSIDA, twice. He joins Steve Fuller (football, 1977-78), Denise Murphy (volleyball, 1985-86), Christine Sherman (volleyball, 1986-87), Kyle Young (football, 1999-00-01), Chad Carson (1999-00-01) and Jonathan Byrd (1999-00) with that distinction. Clemson women’s track athlete Gisele Oliveira could join that list next week when the women’s track academic All-America team is announced. In the pool, Rappold was an Atlantic Coast Conference Champion in the 100 Butterfly and also set the school record in the event. He finished in first place in 11 races throughout the year, including the 100 fly and 100 back at the NIKE Cup last November. He was named to the ACC Honor Roll all four years and won 2004 & 2005 CSCAA Honorable Mention All-America Honors for Academics. Rappold was named to Clemson’s Honor Roll and Dean’s List eight times.